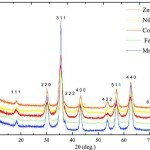 Neutron and X-ray diffraction study of ferrite nanocrystals obtained by microwave-assisted growth. A structural comparison with the thermal synthetic route. Patterning of functional ceramic oxides on metallic substrates by inkjet printing.